If you want to increase your gains and enhance your physical performance, a pre-workout supplement is a step in the right direction. When combined with a good training schedule and proper diet, these supplements can improve your training experience by a significant margin. More energy and more focus means more repetitions at the gym. Here are our picks for the best pre-workout ingredients to boost physical and mental performance in 2017. L-citrulline, commonly known as citrulline malate, is an amino acid that’s turned into L-arginine in the kidneys, enhancing nitric oxide (NO) levels in the blood. Because L-arginine must be processed in the liver, citrulline supplementation is considered to be more effective than L-arginine supplementation. What Are the Benefits of Citrulline Malate Supplementation? Decrease Fatigue During Exercise - Citrulline enhances your training capacity through improved blood flow, lowering your fatigue levels during exercise. This will allow you to perform more reps.
Reduces Muscle Soreness - Taking a citrulline supplement can reduce your muscle soreness after training by up to 40%. Increases Growth Hormone Levels - Citrulline supplementation increases your growth hormone levels with exercise. Higher GH levels improve recovery, metabolism, energy levels, and sleep quality. Alpha GPC is a cholinergic compound used to enhance your power output and cognitive function. While you may not find alpha GPC in your typical branded pre-workouts, it’s worth purchasing separately. This choline supplement has become a staple in the bodybuilding world for the benefits listed below. What Are the Benefits of Alpha GPC Supplementation? Enhances Growth Hormone Production - Taking an alpha GPC supplement can increase growth hormone production in young, healthy adults.This will allow you to build more lean mass, faster. Increases Power Output - Alpha GPC is capable of increasing your power output considerably during workouts. Fat Oxidation - This supplement is capable of increasing your body’s fat oxidation rate, so you will burn more fat while you’re exercising and at rest. Beta alanine is the building block to carnosine, a crucial molecule that assists with the bufferingof acid in your muscles.This supplement helps increase physical performance and boosts lean-mass gain. Carnosine also has antioxidant and anti-aging properties. What Are the Benefits of Beta Alanine Supplementation? Increases Muscle Endurance - Beta alanine increases muscular endurance in the 60 to 240-secondtimeframe, lengthening your body’s time to exhaustion. Reduces Muscle Fatigue - This substance can reduce fatigue and improve cardiovascular endurance for aerobic exercise, allowing you to do more reps or run greater distances. Hypertrophic Effect - Beta alanine can help you build lean mass thanks to its hypertrophic effect which increases the size of skeletal muscle through the steady growth of component cells. BCAAs (Branched-Chain Amino Acids)are found in high protein foods. The three amino acids typically found in BCAA supplements are leucine, isoleucine, and valine. BCAAs are best known for helping bodybuilders and athletes recover post workout, as well as helping maintain lean mass during low-calorie diets. What Are the Benefits of BCAA Supplementation? Preserves Muscle Mass – BCAAs reduce muscle wasting during calorie deficits. This allows you to preserve muscle while cutting or dieting.This is ideal for bodybuilders. Improves Aerobic Exercise - BCAAs supplementation increases the time you can exercise until exhaustion. Although not typically used as an energy booster, this is a side benefit. Increases Fat Oxidation - Taking BCAA supplements will increase your body’s fat oxidation, so you can shed the pounds while building muscle. Much like BCAAs, L-Glutamine is an amino acid that benefits the body during caloric deficits. It is capable of aiding in the muscle building process, but its effects are most noteworthy in those who may have an L-Glutaminedeficit. This includesvegetarians, vegans, and those with low protein and low dairy intake. What Are the Benefits of L-Glutamine Supplementation? Muscle Builder - L-Glutamine is used as a supplement to help with muscle building and mass preservation. It is best used to help maintain a lean, muscular physique when dietary intake is low. Helps The Immune System - Glutamine benefits your immune system. Having a strong immune system will help you maintain your health, allowing you to train all year round. Improves Resistance Training – During intense workouts, your body’s natural glutamine levels drop up to 40%. L-Glutamine supplementation replenishes your body’s supply, boosting recovery and improving subsequent strength and resistance training. Caffeine is a well-known stimulant extracted from coffee beans. It can improve your physical strength, cardiovascular capacity, power output, as well as physical and mental endurance. What Are the Benefits of Caffeine Supplementation? Increases Anaerobic Running Capacity - Caffeine improves your anaerobic cardiovascular exercise, allowing you to perform cardio exercises for longer. Power Output Increase - Caffeine supplementation significantly improves your physical poweroutput. If you have developed a caffeine tolerance, the boost in power output may not be as significant. Fat Oxidation - Caffeine increases fat oxidation and stimulates metabolic activity, aiding in healthy weight management. Creatine is a molecule naturally created in the body that has an essential role in cellular energy release during stress periods. Creatine supplementation will increase your strength and power output, but it can also benefit your liver, brain, bones, and muscles. Power Output Increase - Creatine supplementation will increase your power output by up to 26%. Some people react better than others to creatine.The strength increase will be different for each. Improves Hydration - Creatine improves bodily hydration due to its water retention effect. Lean Mass Increase - Creatine has lean mass building properties, but this may be attributable to skeletal muscle tissue holding additional water. Water retention fuels strength and power output, allowing you to get extra reps at the gym, which in turn helps build lean mass, faster. Acetyl-L-Carnitine is heavily involved in mitochondrial protection and energy metabolism. This compound is produced in the body, but it can also be consumed through supplementation. L-Carnitineis often used as a brain booster or a nootropic, but it is also popular in the fitness world. What Are the Benefits of Acetyl-L-Carnitine Supplementation? Fat Burner - L-Carnitine has a fat reducing effect. While this effect is present in most people, it ismost noticeable in the elderly population or those who are L-Carnitine deficient. Reduces Fatigue - L-Carnitine is useful in reducing mental and physical fatigue. Thiswill help you perform more reps and stay focused through the duration of your workout. Reduces Muscle Soreness - This supplement is effective in reducing muscle soreness after exercising due to an anti-inflammatory effect. This can speed up the recovery process. 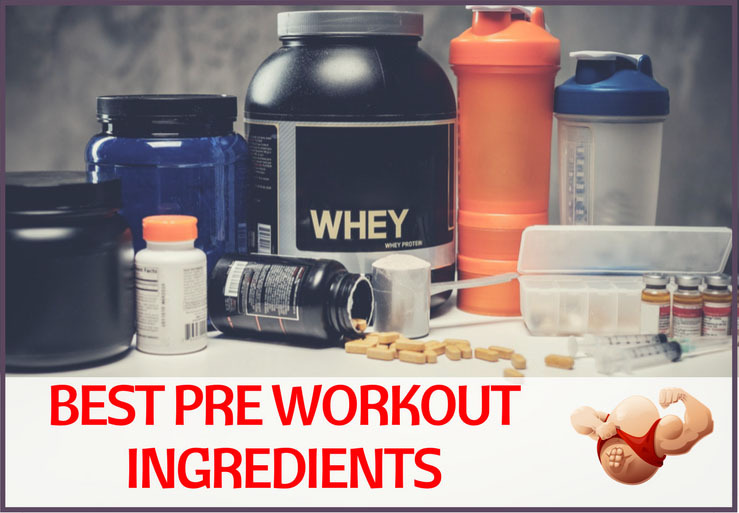 As you can see, these pre-workout ingredients are very effective, and they will help you build muscle and lose fat. There are no miracle supplements that perform overnight transformations. Ultimately, nothing replaces a good diet, a great workout routine, and the right amount of sleep. These pre-workout ingredients are meant to help give you an edge, providing an incremental boost in productivity to help you reach new heights in 2017. This post was written by Daniel Joseph, CEO of CogniTune, LLC a website about smart drugs, brain supplements, cognitive enhancement tips and cutting-edge information on improving brain health and mental performance.